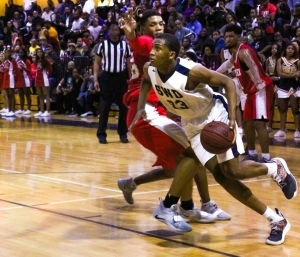 KD Johnson’s layup with 5.7 seconds to play completed the Southwest DeKalb rally from 18 points down with 2:39 left in the third quarter to a 66-65 home win over Woodland-Stockbridge on Tuesday night to advance to the Class 5A boys’ Final Four on Saturday. The No. 3 ranked Panthers will be joined in the Class 5A Final Four by the Lithonia Bulldogs in boys’ play and the Southwest DeKalb Lady Panthers and Columbia Lady Eagles in girls’ action on Saturday at Columbus State University. Johnson’s drive to the basket for the game winner was aided by a nice pick by teammate James Glisson to give him an open lane to the basket. Woodland, the No. 5 ranked team in Class 5A, got the ball down the court but a deflected pass had to be chased down and Curtis Perdue’s desperation three from about 30 feet was long as the buzzer sounded. The Panthers (24-6) advance to the Final Four for the first time since coming up short to fellow DeKalb foe Miller Grove in the 2012 Class 4A state championship game. With Johnson on the bench with three fouls in the second quarter the Panthers struggled to score going the first 7:38 of the period without a point while Perdue scorched the nets for 13 points as Woodland (25-6) built a 34-22 halftime lead. Jarrett Walton’s two free throws with 1.7 seconds left in the first half were the only two points of the quarter for the Panthers. Samuel Lassane’s basket with 2:39 left in the third quarter gave Woodland the 18-point advantage at 50-32. The Panthers answered with an 18-2 run over the next 4:43 of the game to close the gap to 50-52. They ended the third quarter on a 9-2 run to close the gap to 52-41 on Glisson’s layup at the buzzer. Southwest opened the fourth quarter with a 9-0 with Myles Love’s three-pointer from the left corner hitting with 6:16 to play to trim the lead to 52-50 and Woodland was on its heels. Perdue who had 19 of his game-high 26 points in the first half answered though with a three to push the lead back out to 55-50 with 5:56 remaining. Woodland extended the lead to 58-52 with 4:46 to play on a free throw by Diallo Wilburg. Jarrett Walton cut the lead in half as he got a pass from Glisson open in the left corner for the three. Johnson followed with two free throws and took a field from Glisson to give Southwest its first lead since 20-18 with 5:19 left in the first half. After one of the six Woodland turnovers in the fourth quarter, Johnson returned the favor to Glisson with a nice pass for the layup to make it 61-58. Jalen Mason hit a layup and was fouled but missed the free throw to cut the lead to 61-60 with 2:20 to play. Glisson spun on the baseline and made a reverse layup with 1:10 to play to extend the lead to 63-60. Mason answered with a drive of his own to cut the lead to 63-62 and followed with a three from the corner with 21 seconds to play for a 65-64 lead after Johnson hit one of two from the line. The Panthers got the ball in the hands of Johnson who drove the right side of the line used the pick by Glisson for the game-winner. Johnson finished with 18 points (14 in the second half) and five rebounds to lead the Panthers after sitting much of the first half with foul trouble. He was joined in double figures by teammates James Glisson (17), Jarrett Walton (11) and Rion White (10). Perdue’s 26 points was the game-high and Jalen Mason added 11 for Woodland. Southwest DeKalb travels to Columbus State University on Saturday for a 4:00 pm date with No. 1 ranked Buford (27-2), a 69-35 winner over Dutchtown on Tuesday. In other Class 5A boys’ action, the Lithonia Bulldogs (21-9) knocked off defending champion Warner Robins 53-50 at Veterans High School on Tuesday to advance to their first final four since the 2016 loss to Liberty County. The No. 7 ranked Bulldogs got some payback for their Elite Eight loss to Warner Robins last year in knocking the state champion out of the tournament. The two teams shot 33 free throws in the first half with Lithonia clinging to a 25-24 going into the break after an early 10-0 advantage. A see-saw battle ensued and the Bulldogs were down one with 33 seconds to play when Eric Gaines put back his own miss for the 51-50 lead. No. 8 ranked Warner Robins missed the opportunity to tie the game or take the lead with a pair of misses at the free throw line. Lithonia has an 8:00 pm date with No. 7 ranked Fayette County (25-5) on Saturday at Columbus State. Fayette County knocked off No. 6 ranked Kell 77-73 to advance. Raven Thurman scored all of her 14 points in the second half as the No. 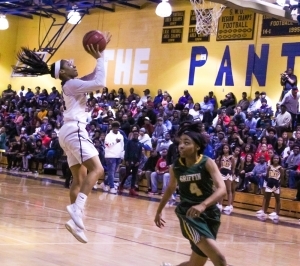 5 ranked Southwest DeKalb Lady Panthers pulled away to a 61-45 victory over the visiting Griffin Lady Bears on Tuesday night. Southwest DeKalb took the lead for good on Alex Jackson’s basket with 3:09 left in the first half to go up 17-16, but Griffin’s Dais’ya Reid score six points in the final 2:23 of the half to keep Griffin in striking distance at 25-22. Thurman then made her presence felt to open the second half after sitting much of the first half with foul trouble. She scored the Lady Panthers’ first six points of the half including back-to-back steals and layups to extend the lead to 31-24. Jayla Kimbrough hit four consecutive free throws in a span of 15 seconds as a technical on Griffin’s bench gave Southwest the ball back. Adrianna Brownlee took a pass from Thurman on a drive and laid it up to send Southwest into the fourth quarter up 49-37. Thurman would hit three more big baskets in the fourth quarter as the lead continued to grow. Lanee Edwards’ two free throws with 55 seconds to play all but sealed the 61-45 win. Raven Thurman finished with 14 points and 8 rebounds and Lanee Edwards added 11 points for Southwest DeKalb. Zacoria Berry had 17 and Dais’ya Reid hit for 10 to lead Griffin. Southwest DeKalb advances to the final for the first time since their 2017 championship game loss to Buford. The No. 1 ranked Buford Lady Wolves (27-2) set up a rematch by defeating Veterans 59-44 on Tuesday to advance. The two teams have combined to win the last three state titles and meet at 2:00 pm at Columbus State on Saturday. The Columbia Lady Eagles rallied from a 45-37 deficit with 5:37 to play with a 13-0 run to defeat No. 10 Wayne County 50-45. Columbia (23-7) led 16-12 after the first quarter but trailed 26-25 at the half. Wayne County (23-5) used a 13-4 run to go into the fourth quarter up 39-35. The lead continued to grow to 45-37 when Columbia began its rally. The gap had closed to 45-42 in just over a minute and Columbia grabbed its first lead since early in the third quarter at 46-45. India Terrell hit four big free throws in the final 23 seconds to seal the win. Constance Thomas led the way for Columbia with 18 points and India Terrill had 16, including 6 of 8 from the free-throw line. Columbia reaches the Final Four for the first time since their back-to-back state championships in 2012 and 2013. Columbia’s 6:00 pm opponent will be No. 2 ranked Villa Rica (31-0) which defeated No. 4 Eagles Landing 67-47. The No. 5 ranked Cedar Grove Saints lost a 55-54 heartbreaker to No. 9 ranked Windsor Forest at home on Tuesday night. Cedar Grove was in a groove early on against Windsor Forest extending a 13-11 first quarter lead to 31-23 at the half. Windsor Forest closed the gap to 39-38 heading into the third quarter. The Saints found themselves trailing 53-46 with 3:13 to play and mounted a rally cutting the lead to 55-54. Cedar Grove got the ball with eight seconds to go in the game, but could not get a basket as time ran out. Cedar Grove finishes 20-7 on the season.